Research increasingly and conclusively shows that effective leaders continue to learn, grow, and change throughout their careers and that a significant part of this development occurs through on-the-job experiences. 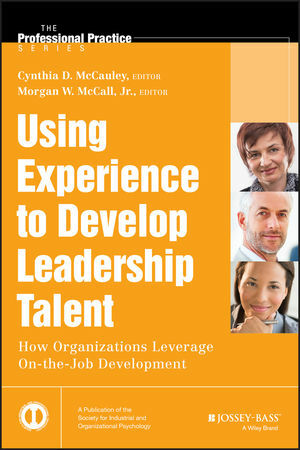 Co-Published by the Society of Industrial and Organizational Psychology and sponsored by the Center for Creative Leadership, Using Experience to Develop Leadership Talent provides real-world strategies, best practices, lessons learned, and global perspectives on how organizations effectively use experience to develop talent. Describing challenges and practices in multinational companies around the world, Using Experience to Develop Leadership Talent will serve as a focused guide to how organizations can use on-the-job development to reshape leader development practices that better integrate work and learning. Cynthia McCauley is a senior fellow at the Center for Creative Leadership (CCL) in Greensboro, NC. From her broad research and applied experience, she has developed expertise in leader development methods, including developmental assignments and relationships, 360-degree feedback, and action learning. She has co-developed a number of CCL’s assessment tools and is co-editor of three editions of The Center for Creative Leadership Handbook of Leadership Development. Morgan McCall is a professor of management and organization in the Marshall School of Business at the University of Southern California. His research on the development and derailment of executives has appeared in numerous books and articles, including the trilogy The Lessons of Experience, High Flyers, and Developing Global Executives. He has applied his work on experience-based leader development at numerous companies, including Disney, Toyota, Microsoft, and Proctor & Gamble. Cynthia D. McCauley and Morgan W. McCall, Jr.